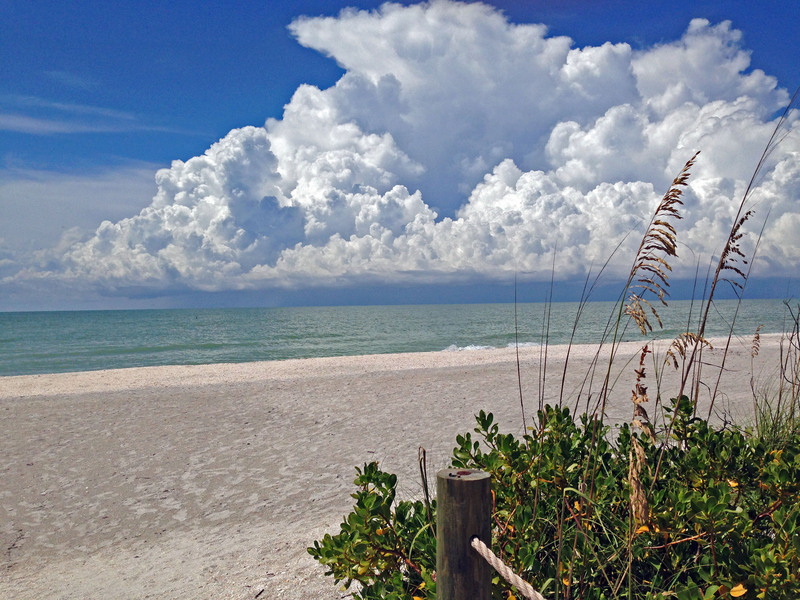 Real Estate Scoop from Sunny Sanibel! It has been another quiet week on sunny Sanibel. The local and national news about the green algae in the river and canals in Cape Coral is making rental phones ring with questions and some cancellations, but if you are here, like The SanibelSusan Team, you have noticed that the gulf waters still are sparkling and usually clear. Here’s a cool picture shared with me this week by Jimmy and Jim Anderson who handle our professional photography. I told them I’d give them a plug when I posted this. Jim’s been taking care of our listing pictures for 25+years! Jimmy’s the drone expert! Nice job, guys! Check out more of their work at ImagesForSuccess.com. Below are a couple of news items followed by the postings in the Sanibel & Captiva Islands Multiple Listing Service since last Friday. This is the off-week for the islands’ Thursday morning Realtor® Caravan Meeting, but next week is our July membership meeting, which always brings more members out. Our new listing at Moonshadows #2C already is signed up to be on the caravan – open July 26 from 9 a.m. until noon at 1351 Middle Gulf Drive. (Here’s a link to the streaming video for Moonshadows, by Jim and Jimmy Anderson). First, on Tuesday is the Association of Realtors® hosted meal packing event for “Meals of Hope”. We have raised the $5,000 needed to pay for the food for 20,000+meals and have more than 50 volunteers ready to get to work, but there is always room for more, so let us know if you want to participate. Teammate Elise and I will be packing then from 3 to 5 p.m., while Teammate Dave keeps the office running. The word is out that Sanibel’s Paper Fig Kitchen is having their soft opening today, July 20. Located in Tahitian Gardens here is what their website says about their offerings: “PAPER FIG KITCHEN in Sanibel believes that even a quick breakfast bite, lunch on the go (or on our Shop porch), afternoon nosh, or “I don’t have time to shop, chop, and prep” take along dinner should be creatively crafted, absolutely fresh, and without a doubt, delicious! Improving flood map accuracy, so fewer property owners have to file expensive appeals. Tell Congress to EXTEND NFIP and PASS Flood Insurance Reform Thank you. On Monday, FloridaRealtors® on line posted the following article from “The Orlando Sentinel”. “Florida’s gross domestic product topped $1 trillion Friday, an economic output that would make the Sunshine State the world’s 17th largest economy if it were an independent country, the state chamber said. “Florida’s economy has grown larger than Saudi Arabia’s, Switzerland’s and Argentina’s, the chamber said. “The economist who authored the study pointed to growth in manufacturing. “Those [jobs] are growing faster here than the U.S. the last few years, ” said Jerry Parrish, Florida Chamber Foundation chief economist. “The $1 trillion figure was calculated based on the U.S. Bureau of Economic Analysis’ most recent GDP number of $984 million for the fourth quarter of 2017, and a formula that projects current statistics that have yet to be factored in by the bureau, including job growth, goods, services and other factors. “Florida has been adding $2.7 billion to its GDP each day on average, the Chamber said in its release. At the start of 2008, the state’s GDP stood at $757 billion adjusted for inflation, according to BEA. It dropped to $715 billion by the third quarter of 2009 but has since risen steadily. The $1 trillion projection would represent a 39.86 percent increase. The July-August issue of REALTOR® Magazine has a good article by NAR Chief Economist (and my favorite crystal-ball reader), Lawrence Yun. His answer to the above question is “They’re waiting until their earnings and home prices are better aligned. “The economy is solidly advancing. The anticipated growth rate of 4 to 5% in the 2nd quarter is remarkable. For the year, the GDP will exceed 3% for the 1st time since 2005. Employment, likewise, is strong: 5 million net new jobs over the past two years, pushing the unemployment rate down to 3.8%, the lowest rate in 50 years. Wages are up too, by 2.8% over the last 12 months. “There is more good news. Despite recent volatility, the stock market has been close to an all-time high, helping push combined wealth in the U.S. across the $100 trillion mark for the 1st time. The median home price has risen 40% over the last fives years and continues to climb. “And yet home sales are down 1% from this time last year, and homebuyer sentiment is tepid. The number of consumers strongly expressing “it is a good time to buy” fell to 38.5% in the 1st half of the year compared to 45% at a similar period last period. “What’s behind the mismatch? For many potential buyers, homes are just too expensive. That’s why more building is critical. Consider advocating for accelerated new construction in your community. Some goals to consider pursuing with local authorities: streamlining the housing permit process; reducing impact feees on new homes; reducing minimum lot sizes; expediting local environmental reviews; promoting the repurposing of outdated commercial buildings into residential units; amending rehabilitation codes, and encouraging use of prefabricated, modular housing, and accessory dwelling units. Causeway Bridge Inspection. – Notice was in the “Island Sun” today that Lee County Department of Transportation will be performing a bridge inspection on Sanibel Causeway Span A next week. The job is scheduled to start on Tuesday (July 24) and finish on Thursday (July 26), weather permitting. Lane closures will be controlled by flagging operation. Affected times will be from 9 a.m. to 3 p.m. daily. 5 price changes: Cottage Colony West #108 1/1 now $624.9K, Cottage Colony West #132 1/1 now $634.9K, Island Beach Club #320F 2/2 now $758.5K, Sundial West #E104 2/2 now $850K, Plantation Village #312 3/2.5 now $1.649M. 4 new sales: Sanibel Moorings #141 1/1 listed at $435K, Loggerhead Cay #313 2/2 listed at $535K, Loggerhead Cay #434 2/2 listed at $629K, Sandpiper Beach #506 2/2 listed at $719K. 5 closed sales: Blind Pass #A205 2/2 $400K, Sanibel Moorings #941 2/2 $510K, Loggerhead Cay #433 2/2 $575K, Lighthouse Point #212 3/2 $746K, Sundial West #E310 2/2 $875K. 3 new listings: 4436 Waters Edge Ln 3/3 $729K, 1307 Par View Dr 3/3 $1.199M, 920 Snowberry Ln 3/3.5 $1.225M. 9 price changes: 2074 Wild Lime Dr 3/2 now $55K, 1339 Tahiti Dr 3/2 half-duplex now $649K, 1807 Serenity Ln 3/2 now $739.5K, 438 Surf Sound Ct 3/2 now $819K, 1035 S Yachtsman Dr 5/4.5 now $999K, 6412 Pine Ave 3/2.5 now $1.175M, 794 Conch Ct 3/2.5 now $1.548M, 599 Lake Murex Cir 3/3.5 now $1.75M, 1133 Golden Olive Ct 3/3.5 now $2.446M. 4 new sales: 5306 Ladyfinger Lake Rd 3/2 listed at $539.9K; 3784 Coquina Dr 3/3 listed at $549,999; 978 Black Skimmer Way 3/2 listed at $695K; 5657 Sanibel-Captiva Rd 3/2 listed at $1.299M. 1 closed sales: 3708 Coquina Dr 3/2 $715K. 1 new listing: 6089 Sanibel-Captiva Rd $4.995M. 2 closed sales: 5723 Baltusrol Ct $287K, 6000 White Heron Ln $705K. 4 price changes: Lands End Village #1655 2/2 now $1.055M, Beach Homes #2 3/2 now $1.999M, Beach Homes #18 4/3 now $3.375M, Beach Homes #13 4/4.5 now $3.949M. 1 new sale: Tennis Villas #3129 1/1 listed at $325K. SusanSusan here reporting the end of another week of gorgeous weather with the island thinning out a little as snowbirds continue to depart and “season” activities wrap up. Many locals and visitors have noticed this week that the water around the islands is beautiful, both gulf and bay side – a brilliant clear teal blue. Seeing the water like that in the spring makes one wish the summer rainy season would stay away, but it’s an inevitable part of the Florida weather cycle. In another few weeks, regular afternoon showers will begin with the first of the afternoon puffy popcorn-like clouds already appearing occasionally, though mostly inland. On Sanibel, closings indicate that homes continue to be the predominate product, with both condo and home prices on the rise. With the winter months being when the most high-end buyers are on island, it makes sense that larger more-luxurious more-expensive properties sell then. This year, it may be surprising to see the jump in the number of closings that are posted this month and in May, since sales activity didn’t pick up until later than usual this year. Perhaps that’s related to the stock market, new tax laws, or something else. Those in the real estate business are happy that it did improve, now we hope that it doesn’t trickle off with folks leaving. As a listing agent, an important consideration always is remaining inventory or the competition. It can provide insight into how long it may take for listings to sell, particularly at this time of the year when the next wave of prospective buyers is expected to be those who may think they can get a great deal buying post-season and before hurricane season. The below table shows the same details as the table above, but this one shows the properties currently for sale and under contract, on both Sanibel & Captiva. Again, the data confirms that Sanibel homes are the hot commodity and indicates that it is the pricier larger ones that are moving. Many of us have buyers just waiting for the right gulf-front pool home. There haven’t been many of those for sale. Not of enough of those exist on Sanibel, which probably is what has caused the bay-front pool home market to get lots of action in the last few weeks. With 192 Sanibel homes for sale, 63 closing first quarter, and another 56 under contract, there still are a lot of homes for sale – probably better than a year’s worth of inventory in my estimation. With Sanibel condos having 34 sales first quarter and another 30 under contract, seeing 104 on the market, probably means that’s close to a year’s worth of inventory too. I bet we see fewer condo sales than we usually do this summer, but I hope I’m wrong. The time to move island lots and Captiva properties are tough to guess-timate because those markets are so small, specialized, and varying in price. Captiva condo statistics can be skewed too, because the 33 gulf-front Beach Home properties (priced as high as $4+million) and 68 units Land’s End Village units within South Seas Resort are home-like but are in condo associations. So, our hopes are that brisk sales continue. Many of our winter listings have sold or are under contract, so we are looking for new listings and working hard to get our remaining listings sold. Our focus shifts to getting showings at the properties that could not be viewed “in season” due to paying guests and promoting them to agents who have not shown them, as well as reminding those who have shown previously that they still are available. Teammate Dave held several Open Houses this week, unfortunately with little traffic, probably because of the beautiful weather. The action posted in the Sanibel & Captiva Multiple Listing Service this week follows a couple of news items below. An interesting article was posted on-line by the “Miami Herald” last Friday, March 30, 2018. It’s by Tom Hudson who hosts “The Sunshine Economy” on WLRN-FM; @HudsonsView. “If you have a home equity line of credit, private student loan, commercial mortgage or business loan, your payment may be tied to LIBOR. The London Interbank Offered Rate serves as the starting point for figuring out how much borrowers owe. But the interest rate underpinning trillions of dollars of loans will be changing. “In the week ahead, the Federal Reserve Bank of New York begins publishing the SOFR. The Secured Overnight Financing Rate aims to be more reliable and less contrived. It also begins a new chapter in the massive move away from LIBOR and its lock as a fundamental price of borrowed funds. “Deep inside most variable interest rate loan documents is LIBOR. Since the 1980s, lenders have leaned on LIBOR as the gauge to set other market interest rates. As LIBOR moves, so moves repayment costs. But it is an imperfect reflection of the cost of cash. “LIBOR isn’t based on actual borrowing. It is a daily poll of banks, asking them what they think would be the cost to borrow from each other without using any collateral. Those are unsecured loans, and fewer banks are conducting business like that. So, the poll has become less accurate. And since it’s a survey of expected costs, not actual costs, the poll is vulnerable to manipulation. A dozen banks have paid billions of dollars in fines for rigging LIBOR rates. “LIBOR lied. The benchmark is broken. “Over the past four years a group of bankers, financiers and American regulators have been working toward a new reference rate. That rate, the SOFR, makes its debut Tuesday morning. It differs from LIBOR in two significant ways; It will be based on actual lending rates between banks, and it will be based on loans using US Treasuries as collateral — a more common practice than LIBOR’s unsecured loans. “The introduction of what may become the new benchmark is far from complete. Whereas LIBOR rates include different durations ranging from overnight loans to those lasting one year, the SOFR is solely short-term money — one day. “New variable interest rate loans likely will include references to SOFR as the new standard. Other loans may include fallback language allowing them to swap the old benchmark for a new one. Having served on the state Contract and Forms Content Committees many times, I often find that I can be too close to this question. The following article was posted on-line this week by Attorney Joel Maxson who is Director of Member Legal Services at Florida Realtors®. Joel also manages the Realtors’ Legal Hotline. “Based on what we hear on Florida Realtors Legal Hotline, most residential sellers are content to complete the Florida Realtors Seller’s Property Disclosure – Residential form (SPDR) around the same time they enter into a listing agreement. However, every now and then, a seller will balk at the idea of completing this form, prompting a member to ask what Florida law requires regarding disclosures. “Although sellers aren’t required to complete this specific SPDR form, a residential seller does have to comply with the rule established in Johnson v. Davis. In that case, the Florida Supreme Court held that “where the seller of a home knows of facts materially affecting the value of the property which are not readily observable and are not known to the buyer, the seller is under a duty to disclose them to the buyer.” These material facts are sometimes referred to as latent defects. “In addition, in Rayner vs. Wise Realty Co. of Tallahassee, the First District Court of Appeal provided that this same disclosure requirement applies to residential properties that are being sold as is. “Sellers can make this disclosure in writing or verbally, although Florida Realtors attorneys recommend that it be made in writing. 12 new listings: Casa Blanca #2 2/1 $379K, Sundial #F205 1/1 $429K, Sanibel Arms #D4 2/2 $549K, Mariner Pointe #1052 2/2 $565K, Sanibel Siesta #306 2/2 $599.5K, Sunset South #6A 2/2 $619K, Sanctuary Golf Villages I #2-5 2/2.5 $759K, Tarpon Beach #206 2/2 $799K, Sundial East #N403 2/2 $889.5K, Compass Point #102 3/2 $1.295M, Bougainvillea #B 3/3 $1.299M, Villas of Sanibel #A102 3/3 $1.495M. 3 price changes: Mariner Pointe #122 1/1 now $399K, Sanibel Moorings #941 2/2 now $524.9K, Gulfside Place #323 2/2 now $1.298M. 3 new sales: Loggerhead Cay #422 2/2 listed at $535K, Sunset South #7C 2/2 listed at $569.5K, Tamarind #B302 2/2 listed at $1.789M. 5 closed sales: Sanibel Moorings #212 1/1 $415K, Loggerhead Cay #264 2/2 $580K (our listing), Surfside 12 #A1 3/2 $790K, Sandpiper Beach #302 2/2 $835K, Gulfside Place #222 2/2 $1.05M (our sale). 7 new listings: 1851 Farm Trl 3/2 $629K, 1339 Tahiti Dr 3/2 duplex $679K, 247 Daniel Dr 3/2.5 $939K, 641 Lake Murex Cir 4/3 $1.125M, 1349 Eagle Run Dr 3/2.5 $1.155M, 872 Limpet Dr 3/3 $1.849M, 1324 Seaspray Ln 3/3 $1.899M. 9 price changes: 317 East Gulf Dr 3/2 half-duplex now $565K; 3784 Coquina Dr 3/3 now $595,995; 1357 Tahiti Dr 2/3 duplex now $629K; 978 Black Skimmer Way 3/2 now $695K; 5410 Osprey Ct 3/2.5 now $749K; 1545 Sand Castle Rd 4/3.5 now $1.149M; 735 Sand Dollar Dr 3/3 now $1.279M; 1743 Venus Dr 4/3.5 now $1.629M; 411 Bella Vista Way 4/4 half-duplex now $2.075M. 8 new sales: 1004 Spanish Laurel Ln 2/2 listed at $598K, 1190 Sand Castle Rd 3/2 listed at $625K, 5307 Ladyfinger Lake Rd 3/2.5 listed at $645K, 1020 White Ibis Dr 3/3 listed at $649K, 1450 Sand Castle Rd 3/2 listed at $749.9K, 852 Lindgren Blvd 4/3 listed at $1.159M, 1475 Angel Dr 3/4.5 listed at $1.549M, 1083 Bird Ln 4/2.5 listed at $3.999M. 6 closed sales: 3021 Singing Wind Dr 3/2 $485K, 1169 Sand Castle Rd 3/2 $650K, 601 Sea Oats Dr 3/2 $659.9K, 4960 Joewood Dr 3/3 $975K, 940 Spoonbill Ct 3/2.5 $1M, 747 Windlass Way 4/3.5 $2.25M. 1 closed sale: 1312 Eagle Run Dr $290K. 2 price changes: Lands End Village #1665 2/2 now $950K, Beach Homes #25 3/2 now $1.995M. 1 closed sale: Bayside Villas #5144 1/2 $370K. 1 price change: 11559 Laika Ln 2/2 now $5.5M. It’s SanibelSusan reporting that all’s well on another sunny Sanibel Friday. I won’t mention the traffic which is worse than I ever remember it pre-weekend. It’s been a constant stream of cars tying up Periwinkle, coming onto the island until midday, when it changes to heavy traffic in both directions. From mid-afternoon on, as usual there is extra traffic heading off-island. Last night it cleared up by 6:30 p.m. So, we grit our teeth, plan our days differently, don’t turn right, and remember that we are sharing fabulous weather with extra snowbirds and vacationers. It makes it a challenge when we are driving with prospective buyers. Those new to the island have a hard time believing that it’s like this for just a few weeks each year. They sure love the weather though. It really has been amazing for February – bright blue skies with a few occasional clouds, daytime temperatures ranging from the low 80’s into the 90’s (record setting numbers), and sparkling water surrounding the island. We had good action with our listing this week, with several more showings scheduled tomorrow during turn-over in some of the vacation rentals. With the big annual Arts and Crafts Fair across the street from the office both tomorrow and Sunday, we hope for some walk-in business. If you have a three-day weekend, we hope you enjoy it. If you are here, we hope you drop in. Monthly Membership Meeting – Yesterday was the February monthly Membership Breakfast Meeting and Caravan for the local Association of Realtors®. Guest speaker was Julie LePore with FIRPTA Solutions, Inc. FIRPTA is the Foreign Investment in Real Property Tax Act of 1980 and it covers the disposition of U.S. real property interest by a foreign person. I’ve covered it in my updates before, but she mentioned a couple of points many Sellers don’t realize. FIRPTA – If you are selling real estate in the U.S. and are NOT a foreign Seller, there still is a form required by FIRPTA. These Sellers must sign a Certificate of Non-Foreign Status which indicates that FIRPTA withholding is not required. So, don’t be surprised if the title company handling your closing asks you to sign a form that includes your social security number or tax identification number. Alternatively, in the case where the Seller is foreign, more questions apply. If the Buyer does not have definite plans to reside at the property at least 50% of the time that the property is in use, the Buyer is required to withhold 15% of the sale proceeds. Yes, that is a requirement of the Buyer. Usually Buyers don’t know this. Here, the title company handles this withholding. If the Buyer will reside the property being purchased, depending on the price, there could be change in the amount needing to be withheld. Best to consult with an expert if you are a Buyer and the Seller is foreign. FIRPTA Solution is a good resource at www.firptasolutions.com. Caravan Announcements – We weren’t lucky enough to get another sale this week, but plenty were announced at the Caravan meeting. One colleague who just listed a $2+M property announced that it went under contract in hours for full-price, cash, quick close. Just an example of what can happen in a situation where a buyer is waiting for an property in a specific location or of a certain size or condition. What’s Happening With the Sanibel Real Estate Market? Using info from the Sanibel and Captiva Islands Multiple Listing Service as described in the disclosure below, here are some summaries. Considering that there are just 362 Sanibel properties for sale, that’s a lot of price reductions. How Many Properties Are Selling Compared to the Competition? Sanibel-Captiva Rotary Club’s 35th Art & Craft Fair – with over 100 artists & food court – tomorrow & Sunday, Feb 17 & 18 at The Community House and Sanibel City Park across the street from SanibelSusan Realty Associations. Open from 10 a.m. to 5 p.m. on Saturday, 9 a.m. to 4 p.m. on Sunday. 7 new listings: Sanibel Moorings #212 1/1 $425K, Sanibel Moorings #141 1/1 $475K, Kings Crown #312 2/2 $799K, White Sands #13 2/2 $949K, Sundial West #E104 2/2 $995K, Blue Gulf #101 3/2 $1.42M, High Tide #B102 2/2 $1.795M. 2 price changes: Beach Road Villa #104 2/2 now $455K, Sundial West #F201 2/2 now $799K. 8 new sales: Tennisplace #D21 1/1 listed at $239.8K, Captains Walk #D5 2/1 listed at $299.5K, Seashells #40 2/2 listed at $349.9K, Sundial West #J307 2/2 listed at $759K, Sundial West #F201 2/2 listed at $799K, Nutmeg Village #201 2/2 listed at $999K, Pine Cove #102 3/2 listed at $1.25M, Seascape #202 3/3.5 listed at $2.195M. 3 closed sales: Colonnades #C3 1/1 $225K; Lighthouse Point #220 2/2 $435K; White Sands #32 2/2.5 $978,625. 8 new listings: 9408 Moonlight Dr 3/2 $599K, 1806 Ibis Ln 3/2 $679K, 5885 Pine Tree Dr 3/2 $699K, 617 Lake Murex Cir 3/2 $839K, 9027 Mockingbird Dr 4/3 $869K, 2629 Coconut Dr 2/3 $1.198M, 735 Sand Dollar Dr 3/3 $1.339M, 519 Kinzie Island Ct 2/2.5 $1.35M. 21 price changes: 6143 Henderson Rd 4/3 now $444.9K, 1040 Sand Castle Rd 3/2 now $549K, 958 Sand Castle Rd 3/2 now $619K, 474 Lake Murex Cir 3/2 now $679.9K, 749 Cardium St 3/2 now $749K, 5430 Osprey Ct 3/3 now $774K, 5410 Osprey Ct 3/2.5 now $799K, 9446 Beverly Ln 3/3.5 now $819K, 924 Beach Rd 3/2 now $895K, 3239 Twin Lakes Ln 3/2 now $899K, 2480 Library Way 3/2.5 now $899K, 1265 Par View Dr 3/2.5 now $899K, 3941 Coquina Dr 3/2 now $979K, 5402 Osprey Ct 4/3 now $995K, 1426 Causey Ct 3/2.5 now $1.195M, 805 Sand Dollar Dr 4/3 now $1.295M, 1995 My Tern Ct 4/2 now $1.349M, 4992 Joewood Dr 3/3.5 now $1.465M, 1525 Sand Carlos Bay Dr 3/2 now $1.575M, 514 Kinzie Island Ct 4/5 now $1.895M, 4166 Dingman Dr 4/4 now $2.599M. 8 new sales: 667 Spartina Ct 3/2 listed at $619,555; 563 Hideaway Ct 3/2 listed at $699K, 3980 Coquina Dr 3/2 listed at $799K; 5657 Sanibel-Captiva Rd 3/2 listed at $895K, 925 Lindgren Blvd 3/2 listed at $995K; 1152 Buttonwood Ln 3/3.5 listed at $1.379M; 1271 Isabel Dr 4/4.5 listed at $3.299M, 1077 Bird Ln 4/4/2 listed at $5.995M. 6 closed sales: 9292 Kincaid Ct 3/2 $480K, 1613 Sand Castle 3/2.5 half-duplex $499K, 1717 Sand Pebble Way 3/2 $610K, 900 Almas Ct 3/3.5 $1.015M, 1313 Eagle Run Dr 3/3 $1.35M, 3945 West Gulf Dr 3/3 $3M. 2 price changes: 412 Tiree Cir now $329,555; 2401 Blue Crab Ct now $679K. 1 closed sale: 2626 Coconut Dr $329K. 1 new listing: Bayside Villas #5144 1 /2 $385K. 1 price change: Beach Homes #25 3/2 now $2.095M. No new sales or closed sales. 1 new sale: 11531 Paige Ct 4/3.5 listed at $3.45M. Enjoy your weekend & Presidents Day! It’s SanibelSusan reporting another Friday of beautiful Sanibel Island weather. Today we continue to watch the track of Hurricane Matthew. It could miss much of Florida, but still bears a close eye. This morning, there also was a news report that red tide which over the last few days has plagued Sarasota county beaches to the north, could be heading this way. There is a red tide watch through tomorrow for Lee and Collier counties. Fingers crossed that early Hurricane Matthew winds disburse it. On the “Upcoming Events” tab above, I have been adding fall/winter happenings as they are scheduled and announced. “Season” is filling up nicely with plenty of things to do. Those here this summer likely noticed the large number of sea turtle nests. As reported on-line at the “Santiva-Chronicle”, as of Monday, “SCCF (Sanibel-Captiva Conservation Foundation) reports that 23,017 sea turtle hatchlings have emerged. With almost 100 nests left on the beach, this season could beat last season’s 26,727 hatchlings. A normally-developed nest yields about 100 hatchlings to offset a survival rate of about 1 in 1,000 once the turtles are in the water. “Last year was a record-setting year here for nests with more than 600. This year has obliterated that mark with a new record total of 826 nests, two of which are endangered green sea turtle nests. “SCCF turtle volunteers comb the beaches each morning during the nesting season to chart the nests, stake them off and protect them from coyotes and other predators. The volunteers have been busier this season than ever before in all three of SCCF’s designated turtle nesting zones. All three zones have set nesting records. The volunteers also log false crawls, where a female turtle comes ashore but for one reason or another doesn’t lay eggs. The previous record for false crawls has also fallen with 1,447 false crawls found this season…. Dunes Speed Humps – To reinforce the 20-mph speed limit to travelers taking this alternate route during high season, four humps have been installed on Sand Castle Road in The Dunes subdivision. Two are on the north side of the circle and two on the south side. Speeders beware! Noah’s Ark – Reopens Tues, Oct 4. Sanibel Farmers Market – The locals are ready and this is an indication that “season” is coming. 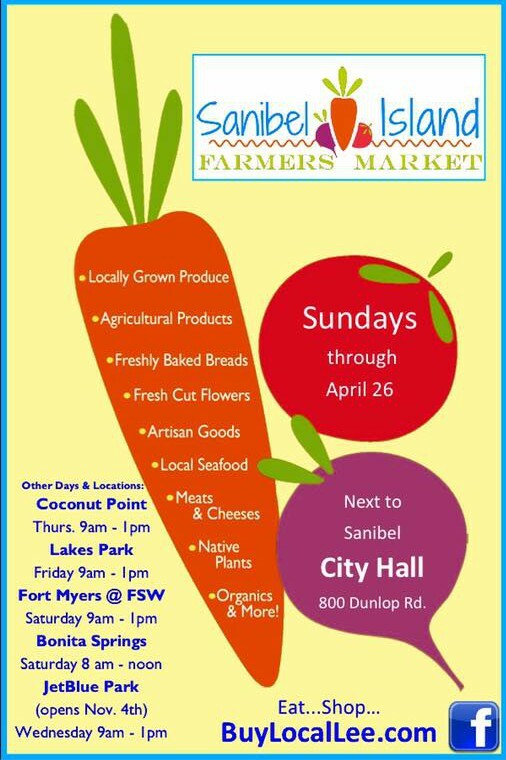 Sanibel Farmers Market opens Sunday and will be open every Sunday through Apr 30 – from 8 a.m. until 1 p.m. on the grounds of City Hall. The only exception is Christmas Day, when it instead will be open the next day, on Monday. Bleu Rendezvous French Bistro – Reopens Thurs, Oct 6. Blue Coyote – Reopens Tues, Oct 4. Sweet Melissa’s Café – Bar renovation is almost complete. They reopen Tues, Oct 4. Trader’s Gulf Coast Grill & Gifts – Has their sold-out Shell Museum fundraiser on Mon, Oct 3. Reopens the next day for lunch and dinner. Totally Baked – in the Island Center, 2407 Periwinkle Way (former location of McIntosh Books) where construction began this week, is expected to open in early Nov. This week, Sanibel Planning Commission approved a variance and development permit that will allow them to have 16 outdoor seats. “The nonpartisan Tax Foundation released its 13th annual State Business Tax Climate Index, which measures how well-structured each state’s tax code is by analyzing more than 100 variables in five tax categories: corporate, individual income, sales, property and unemployment insurance. “Wyoming once again took first place with the most competitive tax code in the country, while New Jersey maintained its long-standing position at the bottom of the pack. “Sellers may feel hesitant to reveal any minor problems with their home; afraid they’ll scare off buyers. But here’s a warning for your sellers: They may land in legal trouble if they fail to disclose. ““In general, sellers should disclose any known facts about the physical condition of the property, existence of dangerous materials or conditions, lawsuits or pending matters that may affect the value of the property, and any other factors that may influence a buyer’s decision,” according to a recent article at realtor.com®. “This includes disclosing issues that have been previously repaired, Davis says. Also, disclose any inspection reports. ““It is much better to lose a buyer by clearly disclosing all known issues than it is to spend two years and tens of thousands of dollars in litigation,” says Adam Buck, a certified real estate specialist with the Frutkin Law Firm in Arizona. “Rest assured, sellers won’t be put on the hook for failing to disclose issues that they didn’t know about. They should be careful not to make any guesses when prompted, particularly when it comes to the measurements of the home — one common problem area for disclosures. 3 new listings: Sanibel Surfside #225 2/2 $799K, Atrium #201 3/3 $1.595M, By-The-Sea #9 3/2 $1.749M. 2 price changes: Tennisplace #D22 1/1 now $245K, Tanglewood #1A 3/2 now $1.099M. 1 new sale: Tennisplace #D21 1/1 listed at $229K. 4 closed sales: Loggerhead Cay #462 2/2 $505K, Sanibel Moorings #1542 3/2 $750K, Sundial West #A205 2/2 $789.5K, Surfside 12 #B1 3/2 $862.25K. 2 new listings: 2401 Shop Rd 2/1 $298K, 1525 San Carlos Bay Dr 3/2 $1.995M. 3 price changes: 9209 Kincaid Ct 3/2 now $489K, 1501 Sand Castle Rd 5/3.5 now $1.049M, 1842 Woodring Rd 3/3.5 now $2.295M. 4 new sales: 1364 Jamaica Dr 2/2 listed at $629.9K, 588 Hideaway Ct 3/2 listed at $699K, 3850 Coquina Dr 3/3 listed at $899K, 584 Kinzie Island Ct 3/4 listed at $1.795M. 1 closed sale: 774 Sand Dollar Dr 3/2 $1.225M. 1 new listing: 2401 Blue Crab Ct $879K. 1 closed sale: Beach Villas #2416 1/1 $507K. 1 price change: 16464 Captiva Dr 8/8.5 now $6.295M. 1 closed sale: 11523 Wightman Ln 4/4 $1.82M. So as September comes to an end, the wonderful popcorn-like clouds won’t be seen as often. They seemingly jump from the sky & create the best sunsets! Here are a couple from this week! Great weather, great traffic, a Great White Pelican, and great effort by Sanibel Mayor Kevin Ruane and other Southwest Florida leaders. Read about it all here this week. 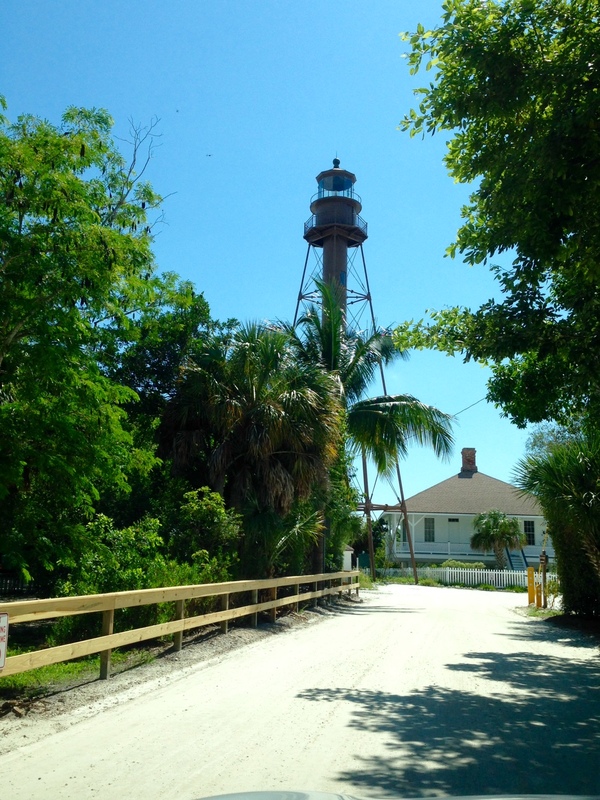 Below are a few news items collected by SanibelSusan, followed by the action this week in the Sanibel and Captiva Islands Multiple Listing Service. Only two sales were announced at our Realtor® Caravan Meeting yesterday, but many price reductions. It’s that time of the year. Here’s a summary of Sanibel’s residential inventory today. Sales are chugging along nicely. Yes, the weather has been extraordinary – sunny days with mid to high 70-degree temperatures during the day with more of the same expected in the days to come. The forecast for the next week has daytimes as warm as 81 degrees and evenings as cool as 61 degrees. How perfect is that? Yes, it has contributed to traffic delays yesterday and today, but the 79th Annual Sanibel Shell Festival is well worth it. Record crowds are attending the event at The Community House across the street from Sanibel Square and our office. It winds up tomorrow (Sat) from 9 to 4 p.m. If you are on the island be sure to get there before it closes. Congratulations to our friends who have garnered ribbons. You know who you are. Our photographer friend, Roberta Schuldenfrei, was beside herself this week after seeing the ‘Ding” Darling refuge’s newest visitor, a Great White Pelican. It was reported that when this pelican appeared on Sunday, it may have been the first North American sighting of this bird which usually is found only in parts of Africa, Europe, and Asia. Word of its arrival spread quickly through the birding community with the refuge reporting record numbers of visitors as a result. Park rangers say that they don’t know why the Great White Pelican is here or where it came from. They say that it has not been banded or clipped which would indicate that it escaped from somewhere. They don’t know where it came from. Maybe it took a vacation – we know lots of snowbirds do that. The Great White Pelican looks somewhat like the White Pelican that is a common winter resident at the refuge, but it is much larger. It feeds the same way as the White Pelicans and mingles with them. It has been seen at various points along Wildlife Drive at low tide. The Great White is a bit pinker or rosier than the White Pelicans, according to Wikipedia, and their wing span can be from 7 to almost 12 feet. As reported in the “Island Sun” today, “Less than 24 hours after returning from Washington D.C., Sanibel Mayor Kevin Ruane and two of his fellow mayors – Marni Sawicki of Cape Coral and Randy Henderson of Fort Myers – joined three additional Southwest Florida leaders for a 2-hour workshop to discuss the progress they made in the nation’s capital regarding ongoing water issues. “On Feb 26, Ruane, Sawicki and Henderson were joined by mayors Ben Nelson of Bonita Springs, Anita Cereceda of Fort Myers Beach and Nick Batos of Estero at MacKenzie Hall, Sanibel, where the group – along with Lee County Commissioner Brian Hamman – talked about the 19 meetings they had over the course of three days in Washington…. “The trio of Lee County mayors met with Florida’s congressional delegation – including local representative Curt Clawson – as well as Senator Bill Nelson, the U.S. Senate Committee on Environment and Public Works, the U.S. Senate Appropriations Committee and the Energy and Water Subcommittee of the U.S. House of Representatives Committee on Appropriations. “The coastal communities of Lee County are once again being devastated by freshwater discharges from Lake Okeechobee and the Caloosahatchee watershed. Damaging high-volume freshwater releases are impacting the ecology of local waters, the quality of life for its citizens, the strength of area businesses, and it continues to have a lasting effect on the local economy. “According to the mayors, these impacts are occurring as a direct result of inadequate water storage within the Kissimmee, Lake Okeechobee and Caloosahatchee watersheds and the inability to effectively move water south into Everglades National Park and Florida Bay. “Record rainfall throughout South Florida associated with strong El Nino conditions this winter have resulted in the level of Lake Okeechobee approaching 16.5 feet. To protect the communities that surround Lake Okeechobee, the U.S. Army Corps of Engineers is conducting high-volume regulatory releases from the lake to the coastal estuaries, with the Caloosahatchee on the west coast and the St. Lucie on the east. “For nearly a month, weekly average freshwater flows to the Caloosahatchee have been more than three times the high-flow harm threshold (9,000 cubic feet per second) and are producing lethal conditions for oysters and other economically important fish species within the estuary. The discharges are also generating a freshwater plume extends throughout Pine Island Sound and into the Gulf of Mexico, blanketing Lee County’s beaches and coastal communities with dark,, nutrient-laden water that is devastating the local tourism-based economy. “At the workshop, each of the mayors made a pledge to inform their respective council members to ensure that everyone is “on the same page”…. “James Evans, Sanibel’s department of natural resources director, reported that as of Friday morning, Lake Okeechobee stood at 16.36 feet. With the freshwater flows out of the lake, ordered by the U.S. Army Corps of Engineers, the lake level dropped approximately 1.4 feet over the last week. However, 77% of the water coming out of the lake is directed toward the Caloosahatchee. “Evans also noted that those freshwater releases will harm the upcoming spawning season for several marine species. However, this year’s plume only extends about one mile offshore from Lighthouse Beach towards Fort Myers Beach. The freshwater plume which occurred in the summer of 2013 extended more than 12 miles out into the gulf. ‘The U.S. Army Corps of Engineers Jacksonville District will reduce the amount of water flowing from Lake Okeechobee beginning this weekend. “Starting Friday (March 4), the new target flow for the Caloosahatchee Estuary is 4,000 cubic feet per second (cfs) as measured at Moore Haven Lock (S-77) located in the southwest part of the lake. The new target flow for the St. Lucie Estuary is 1,800 cfs as measured at St. Lucie Lock (S-80) near Stuart. Additional runoff from rain in the St. Lucie basin could occasionally result in flows that exceed targets. “Today, the lake stage is 15.83 feet, down more than a half foot since it peaked at 16.40 feet on February 8. The Corps will continue to monitor conditions and adjust flows as necessary to balance the competing needs and purposes for water in Lake Okeechobee. “Additionally, Jacksonville District water managers are updating the formula used to calculate water flows through the spillway gates at the St. Lucie Lock structure. When drier conditions took hold during the latter part of February, water managers noticed an anomaly. In working with the U.S. Geological Survey (USGS), engineers determined that the reported flows through the spillway exceeded actual flows by 1,500-2,500 cfs. “Homeselfe, a home energy assessment app and web service for homeowners, recently released a list of several significant tax credits available to those who made energy efficiency upgrades to their homes in the 2015 tax year. ““If you upgraded your home in 2015 by adding insulation, one of the most cost-effective upgrades you can make, you already know you are saving on your utility bills every month plus you may be eligible for a tax credit on that investment,” said Ameeta Jain, co-founder and spokesperson of Homeselfe. As a dog lover and because it was my grand-dog’s birthday this week, I got a kick out of reading this article in Wednesday’s Realtor®Mag. We recently had a home listing go under contract to a condo owner who wanted to move to a home so that she could get a dog. This article describes how times are changing. “The real estate business traditionally has shown scant love for pets. The conventional wisdom held that sellers should conceal all traces of their dogs or cats—the toys, bowls, beds, even the animals themselves—when prepping a home for sale. But those hardline messages are clearly softening, as pets become a plus in the marketing of homes for sale. “The reason for the shift has a lot to do with the numbers: Pet power is rising. Currently 65% of households own a pet, up from 56% in 1988. A record-breaking 79 million U.S. households now own a pet, according to a recent survey of pet owners by the American Pet Products Association. Indeed, 83% of pet owners consider their pet to be a member of the family, according to a Packaged Facts research report. “For real estate practitioners, addressing that pet love means helping buyers scout for homes that meet the needs of their pets or working with sellers to leverage their home’s pet appeal. “In fact, pet-friendly agents have found one another—and consumers—on a growing national social platform called the Pet Realty Network. The network, launched in 1997, now boasts about 300 members who pay $30 annually to be included in the directory and can add to its pet-friendly listings. “The pet advantage is notable at every price point. For a $5 million listing in 2013, the Boutique Real Estate Group in Corona Del Mar, Calif., produced a video showing off a luxury 6,300-square-foot, six-bedroom home all from the perspective of a French bulldog named Rocco. The bulldog even wore a custom-made suede collar in the video, inscribed with the property’s URL,49GoldenEagle.com. Raj Qsar, owner of The Boutique Real Estate Group, says the idea to star Rocco in the video, which came about after the dog took a liking to his team as they toured the space, helped him secure the listing. “They loved the idea,” he says. “Joining the pet craze, home builders are touting pet-accommodating floor plans, such as those with pet nooks in mudrooms. Also, luxury condo buildings are marketing amenities to pet-loving households, offering rooftop pet parks and spas (complete with “pawdicures”), dog-bone-shaped swimming pools, pet fitness yoga classes and treadmill sessions, and even “yappy hours” social mixers. This was posted on “Daily Real Estate News” last Friday. “Home owners can overdo it when it comes to the upkeep of their home. This Old House recently spotlighted several ways that home owners’ enthusiasm for home ownership may actually harm the house. Having light bulbs that are too bright. You want a well-lit home, but exceeding a lamp or light fixture’s recommended wattage can be dangerous, particularly with incandescent or halogen lights, says John Drengenberg, consumer safety director for Underwriters Laboratories. “Using a bulb with too-high wattage will cause the fixture and its wiring to overheat,” he notes, which could then allow the heat to travel to the wall or erode the insulation on the wires and lead to a house fire. Check the fixtures label to make sure you use the correct wattage. Planting trees near driveways or walkways. A line of trees to the house may up its curb appeal but adding young trees near driveways or walkways could be putting your slab at risk. As these trees grow taller, their roots will go outward, potentially pushing up the paving and causing it to buckle or crack. This Old House recommends planting small trees that will remain under 20 feet at maturity and that are at least 10 feet from paved areas. For larger trees, leave at least a 20-foot radius. Over scrubbing a sink. Don’t overdo it with abrasive cleaners; they can scratch the sink. “Cleaners with a grit or grain to them will wear away at the finish and dull it,” Kohler‘s Mike Marbuch told This Old House. “That will make the sink more prone to gunk sticking to it—actually making it look dirtier.” Try a liquid cleanser like vinegar or lemon juice on the sink and avoid scrubbing it every day. Overdoing it with can lights. Excessive recessed lighting in a home can cause a lot of air leaks. Recessed lighting is known as causing heat-sucking air leaks, especially when the fixtures are unsealed in vaulted ceilings. Airtight recessed lighting fixtures are available that are rated for insulation contact (IC). Also, use as few recessed lights as you can, especially when it comes to adding them to cathedral ceilings or in rooms directly below unconditioned attics. Spreading too much mulch outside. “Over-mulching will suffocate plants, confuse their root systems, and prevent water from percolating into the soil,” notes the article at This Old House. “If you’ve mulched so much that tree trunks and flowers’ and shrubs’ lower branches are covered by or dragging in it, you’ve gone overboard.” Have mulch no thicker than 3 inches. Using glass cleaner on mirrors. Watch out for store-bought sprays that promise to make your glass sparkle. “A drop of liquid running around the mirror’s edge can cause the reflective backing to lift or craze,” This Old House notes. The black edge can occur from using ammonia- or vinegar-based cleaners. This Old House recommends using warm water and a soft, lint-free cloth to clean mirrors. Or if you do use the sprays, spray it onto a dry cloth first and not directly onto the glass. Repainting too much. “Excessive paint is detrimental – especially on an older house, which may have layers of thicker oil-based paint, which becomes brittle with age,” notes This Old House. To avoid thick, cracked, or peeling paint, be sure to carefully power-wash prior to painting, sand areas that need it, and then use 100% acrylic-resin exterior paint. If you are looking for a little listening pleasure at the end of the month, the time is now to get your tickets for the BIG ARTS Community Chorus Spring Concert. Since the group’s two evening performances have sold out in recent years, this year an afternoon matinee has been added to the schedule. Celebrating the 400th anniversary of William Shakespeare, the program includes tunes from Broadway to merry old England with songs from around the world including selections from West Side Story, Kiss Me Kate, and a special commissioned piece by composer Gregory Brown. Tickets are available now at the BIG ARTS Box Office. $10 for adults. Kids and students are free. Performances are in BIG ARTS Schein Performance Hall on Mar 29 at 7 p.m., Mar 30 at 2 p.m., and Mar 31 at 7 p.m. SanibelSusan sings with the altos and with the Ensemble too. Hope to see you there! 4 new listings: Mariner Pointe #733 2/2 $529K, Loggerhead Cay #402 2/2 $595K, Donax Village #14 2/2 $569K, Loggerhead Cay #181 2/2 $725K. 9 price changes: Seashells #38 2/2 now $375K, Mariner Pointe #813 2/2 now $449K, Coquina Beach #4C 2/2 now $499.9K, Blind Pass #B209 2/2 now $539K, Surfside 12 #A2 3/2 now $699K, Sunset South #12C 2/2 now $784K, Sanibel Surfside #117 2/2 now $965K, Sanibel Seaview #A1 3/3 now $1.249M, Gulfside Place #117 2/2 now $1.285M. 4 new sales: Sanibel Arms West #A6 2/2 listed at $539K, Sundial East #O402 2/2 listed at $655K, Snug Harbor #113 2/2 listed at $985K, Wedgewood #306 3/3.5 listed at $1.379M. 4 closed sales: Seashells #33 2/2 $270K (short sale); Mariner Pointe #411 3/2 $519.75K (our listing & sale); Lighthouse Point #113 3/2 $634K; High Tide #B101 2/2.5 $1,750,125. 14 new listings: 748 Marthas Ln 3/2 $509K, 1521 Wilton Ln 3/2 $575K, 5105 Sanibel-Captiva Rd 4/3 $699K, 1052 Fish Crow Rd 3/2 $749K, 1438 Albatross Rd 4/3 $779K, 676 Emeril Ct 3/3 $789K, 1487 Sand Castle Rd 3/2.5 $814K, 1429 Jamaica Dr 3/3 $829K, 9027 Mockingbird Dr 4/3 $839K, 792 Birdie View Pt 3/3.5 $1.119M, 3386 West Gulf Dr 3/3.5 $1.349M, 824 Limpet Dr 3/3 $1.395M, 5771 Baltusrol Ct 3/4 $1.398M. 14 price changes: 1390 Middle Gulf Dr 3/3 half-duplex now $549K; 746 Cardium St 4/2 now $599,998; 1125 Captains Walk St 3/3 now $699.9K; 3850 Coquina Dr 3/3 now $899K; 1314 Par View Dr 4/3 now $945K; 232 Robinwood Cir 4/3 now $1.389M; 4353 Gulf Pines Dr 3/2.5 now $1.479M; 4014 West Gulf Dr 3/2/2 now $1.595M; 1743 Venus Dr 4/3.5 now $1.795M; 1688 Hibiscus Dr 3/4 now $1.849M; 626 Kinzie Island Ct 3/2.5 now $1.899M; 2451 Blind Pass Ct 4/4.5 now $2.299M; 2518 Tropical Way Ct 3/3.5 now $2.395M; 911 Strangler Fig Ln 4/3 now $2.695M. 7 new sales: 3301 Twin Lakes Ln 2/2 listed at $599K, 689 East Rocks Dr 3/3 listed at $759K, 5757 Pine Tree Dr 3/2.5 listed at $899K, 345 East Gulf Dr 3/2.5 listed at $899K, 979 Oyster Ct 2/2 listed at $940K, 1111 Schooner Pl 3/3 listed at $949.5K, 411 Lighthouse Way 4/3 listed at $1.445M. 6 closed sales: 1653 Bunting Ln 3/2.5 $434,716; 450 Lake Murex Cir 3/2 $505K; 2079 Wild Lime Dr 3/2 $570K; 1224 Par View Dr 3/3 $905K; 6015 Clam Bayou Ln 4/3.5 $2.05M; 3911 West Gulf Dr 5/5.5 $4.3M. 1 new listing: Tennis Villas #3227 1/1 $287K. 3 price changes: Tennis Villas #3111 1/1 now $244K, Bayside Villas #4202 1/2 now $310K, Tennis Villas #3131 2/2 now $410K. 1 closed sale: Ventura Captiva #1B 3/3 $1.1M. 2 price changes: 14980 Binder Dr 4/3 now $1.378M, 14860 Mango Ct 5/4 now $2.344M. 1 new sale: 15000 Binder Dr 3/2 listed at $1.049M. 1 new sale: with contingencies: 16297 Captiva Dr listed at $1.549M. Until next Friday, here’s hoping great things continue! This week the Sanibel/Captiva weather improved, even saw a little sunshine, before it deteriorated again midweek. With a record 12″ of rain this month, compared to the average January when there are only 2”, those here on vacation probably are not happy campers. There also was gridlock traffic on both Sunday morning and Monday evening when accidents on the causeway brought incoming and outgoing vehicles to a standstill. The Monday event had both main and secondary roadways at a crawl for hours. There now is a lake in the parking lot behind the office, but clearing is expected today. The rain sure beats the white stuff stacking up in much of the country and the dry spell out west. Mother Nature and her friend El Nino get the attention of all of us! Unfortunately with bad weather, island real estate action has slowed down. After a couple of news items below is the action posted in the Sanibel & Captiva Islands Multiple Listing Service this week – just a handful of sales. The Florida Realtors® leadership team and state committees meet twice a year in Orlando, now and again in late August. I was appointed to two this year and should make it to Orlando in time to attend the Major Investors RPAC (Realtor Political Action Committee) Reception tonight, followed by the annual RPAC Jamboree where the Sanibel & Captiva Islands Association of Realtors® should clean up with several awards. After dying my hair pink last May as part of the challenge to raise a few more dollars, I sure hope we come home with trophies. Island property owners may not know it, but the Sanibel/Captiva Association of Realtors® has put plenty of RPAC dollars to good use here. They have helped in beach re-nourishment, the eventual passing of the City’s build-back ordinance, and more recently to pay for the study that convinced local and state politicians that poor water quality negatively affects property values. Water quality issues have been in the forefront for our association for the last 20-some years with the fight continuing at the state meeting today when representatives from Sanibel report about what is happening with the water around Southwest Florida at the Florida Realtors® Land Use, Property Rights, and Sustainable Development Subcommittee Meeting. Saturday I take part in the Florida Realtors® Professional Standards Forum, followed by the Resort & Second Home Specialists Forum. Saturday night is the Inaugural Banquet, then I’ll be back on the road first thing Sunday morning heading back to Sanibel. “AT&T has applied for permits to install its equipment on Sanibel, a move that would improve cell reception and put an end to the impasse between the city and the communications giant. “The application was made Wednesday, Jan. 27, just days after the mayor involved the island’s citizenry, but months after the island thought it would happen. The installation is expected in the second quarter of this year and Mayor Kevin Ruane said the city will do all it can to make it happen as soon as possible. “The development and building permits applied for Wednesday by a third-party contractor will allow AT&T to install its equipment on the Donax Road cell tower already occupied by Verizon. 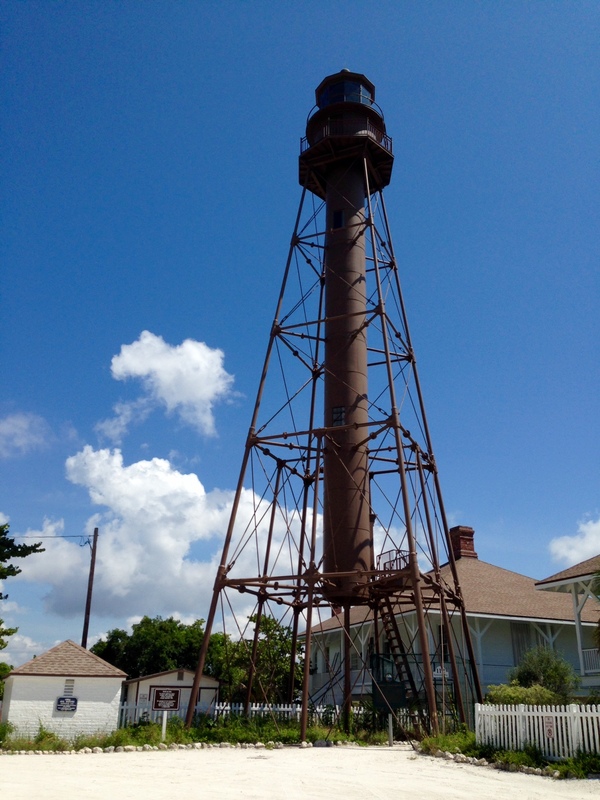 The installation will significantly boost the wireless reception on a big part of Sanibel Island for AT&T customers. “Ruane turned the city loose on AT&T last week. In appearances around the island, he gave citizens phone numbers and the e-mail address of AT&T’s Maria Johnson, the area representative, and urged all to contact her. The Chamber of Commerce transmitted the mayor’s message. “All that came after months of inactivity that followed the sudden withdrawal last summer of permits to put up the equipment. The City Council discussed it in August and the resulting story in the Santiva Chronicle caught the eye of someone who introduced Ruane to Johnson. “Then things went silent, according to Ruane. On Wednesday he found out why – Johnson left her position with AT&T in November. Ruane spoke Wednesday with Don Sadler, a new representative from AT&T, who told him the permits had been applied for and work would be completed no later than the second quarter. “We don’t have an exact time frame, but no later than the second quarter,” Ruane said. “That frustration has been building since the end of last year following his September meeting with Johnson. “Ruane said Sadler told him correspondence to Johnson had been rolling into a central bank and Ruane surmised that the recent glut of contacts from Sanibel caught AT&T’s eye. Take the pets with you when you go. Not everyone likes pets. What’s more, some home buyers will have allergies and your pet could make them sick. “Imagine, as a buyer, having the background music set to ‘barking dog’ while you are trying to take in the home’s nuances that you, as the seller, have worked so hard to hone,” says Brenda Hayward, a real estate professional with Coldwell Banker. Have some refreshments available. “Putting out a few small bottled waters in a small bowl of ice is always appreciated, along with some light, easy grab-and-go sort of refreshments like mints or cookies,” says Cara Ameer, a real estate professional with Coldwell Banker. See the full list of tips at realtor.com®. As Realtors® part of the job includes helping buyers and sellers learn what is new to meet their own needs as well as the desires of future buyers. The following article is a long one, so I shortened it up some – but right-on. Written by Barbara Ballinger, it came from the Tuesday on-line edition of RealtorMag®. “Design changes, as does architecture. Trends don’t emerge as rapidly here as they do in say, food or fashion, but the economy, the environment, and demographics all spur shifts in the choices of materials, designs, layouts, and construction methods for single- and multifamily dwellings. “These 12 trends reflect ways to cope with environmental challenges, incorporate new building materials and methods, and alter the looks and functionality of our homes. Hear top designers and architects explain why these emerging trends are important and how they’ll influence real estate choices in the near future. “1. More Resilient, Sustainable Homes – Mounting climate change pressures mean buildings need to better withstand natural disasters. Similarly, because our natural resources are dwindling, it’s increasingly important that structures be designed and built sustainably. Industry professionals are finding materials and construction techniques to meet both challenges. The Fortified Home Certification standard—created by the Insurance Institute for Business & Home Safety and Architectural Testing Inc.—represents engineering and building levels that provide sturdier structural envelopes that are more resilient against the worst weather conditions than those found in most current building codes. And the trends of making better use of natural resources and generating energy on site—for a double win of more energy and less money spent—will continue into 2016… Increased durability means more lives and buildings will be saved, costs to rebuild will be pared, and insurance premiums will be lowered. The trend is happening nationwide, not just in hurricane-prone locales like Florida…. “2. Classics, Made More Affordable – More home owners want quality, luxurious materials, but the finest choices aren’t always in the budget,… With construction and material costs increasing, the need has emerged for less expensive options that still look luxe and hold up well. For example, instead of solid stone facades, architects may opt for stone veneer on studs and drywall instead of plaster inside. Or, rather than go with terra-cotta, a timeless but expensive material, they can select a handsome thin terra-cotta veneer applied to manufactured panels…. “3. Drought Awareness – Droughts continue to affect large areas of the U.S., making water more expensive and decreasing its availability, especially in the Southwest and California. Water-saving fixtures such as low-flow toilets and showerheads have become standard—even mandated—in many areas…. Water conservation will become as important as energy conservation, and homes that collect as much water as they consume will be as popular with buyers as Net-Zero–energy homes now are… with more demand for water-saving measures such as water-smart irrigation sensors, composting toilets, gray-water recycling systems, and rainwater harvesting. “4. Digitized Manufacturing – Sustainable materials such as glass, in conjunction with new manufacturing technologies, are expanding the choice of colors, textures, and sizes of materials available for home design. At the same time, 3-D manufacturing, what some call the third industrial revolution, has created a new panoply of readily available, prefabricated materials as an alternative to more expensive custom choices…. The glass-and-LED combination is just one new technique that can result in a product that incorporates a sustainable material into a sturdy, practical, energy-efficient, and glamorous new surface for kitchen and bathroom countertops. Such choices greatly personalize rooms much more than another granite, laminate, or Corian top might do, and help to distinguish listings in a crowded market. “5. Reclaimed Wood Floors – Many home owners crave authenticity, no matter how durable, affordable, and convincing the imitations may be. A case in point: the increased demand for reclaimed wood boards, which wear well, show the patina of age, and reveal visual character….The type of wood flooring found in many homes will take on greater importance for many segments of the home-buying population, and it may be that soon not just any wood will do. The crème de la crème of wood flooring —reclaimed boards—may become the equivalent of once sought after granite and now quartz or marble…. “6. Softening Modern Severity – With so many home owners now favoring modern design, yet not wanting a harsh, laboratory look, designers search for alternatives…. “7. The Tiny House Movement on Wheels – Downsizing is big, reflected in part by the growth of the tiny house movement. But flexibility and mobility are also sought after, and many desire a hipper method of attaining this than RVs can offer…. The design profession keeps looking for options beyond traditional, stick-built houses, hence the uptick in prefabricated, manufactured housing. This brand-new example offers shelter to those who are keen on smaller houses, but don’t like the idea of always staying put,… It also offers other possibilities for the real estate industry. It allows some home owners to “test drive” small-scale living. And if the trend continues to expand, landowners may find empty lots in vacation areas to be the perfect spot to rent out to these home owners on wheels. “8. Walk-In, Universal Design Pantries – Currently there are 78 million baby boomers and the aging population is increasing — in fact, it’s expected to rise by 50% between 2010 and 2020, according to Aging in Place, a state survey of livability policies and practices. A deep, wide walk-in pantry allows a walker or wheelchair to maneuver through easily…. “9. Better Integration of Indoors and Outdoors – Screened porches once were the prime quasi-outdoor space in a home that could protect occupants from bad weather yet offer a feeling of the outdoors. But many porches block daylight and views, and they can only be used part of the year in some climates. Now, well-designed, large-scale door panels that fold up like garage doors or open into a home’s walls via big pocket doors are becoming more readily available at affordable prices,… Some have highly functional, retractable insect screens, too… These new bigger openings permit better views of the outdoors, greater enjoyment, and easier access between indoors and outdoors…. “10. Softer, Layered Color Palettes – Color trendsetter Pantone typically debuts only one superstar color of the year. But in 2016, two are taking center stage: “rose quartz” and “serenity.” Both reflect the rise of softer colors, along with the continued use of whites and creams. Some designers think this color direction and its layered palettes lead to a more personalized, sophisticated design….Time will tell if a non-election year and fewer terrorism threats may inspire a return to bolder hues…. These new colors are already turning up inside homes in countertops and backsplashes…. “11. Copper Chic Surges (Even More) – The old standby of copper—think of those pots your parents, grandparents, or Julia Child used—started its re-emergence last year. And the reason that it’s becoming a more widespread alternative to stainless steel, wood, and other materials isn’t all surface. Yes, copper can add sheen, sparkle, and a 1940s Hollywood glamour. But an equally big impetus is that it reduces more than 99.9% of bacteria in between routine cleanings, important because antibiotic-resistant superbugs are on the rise…. This shiny gold-like hue will become more prevalent in homes as concern grows about buying healthy houses without mold, toxins, and bacteria. To help, U.S. manufacturers are producing more options in copper than just refrigerator, oven, and other appliance fronts, the developments that initially helped revive the trend. Throughout homes, buyers can add copper sinks, door handles, light switches, and trim. To enhance its appeal, manufacturers are also expanding the types of hues available. Already, there’s a copper-penny color, brushed nickel, yellow brassiness, and bronze on the market. 6 new listings: Heron at The Sanctuary #1B 3/3.5 $599K, Surfside 12 #A2 3/2 $799K, Sundial East $M301 2/2 $799K, Pointe Santo #B25 2/2 $849K, Atrium #302 2/2 $1.645M, High Tide #B101 2/2.5 $1.795M. 7 price changes: Lighthouse Point #113 3/2 now $639K, Sanctuary Golf Villages #2-2 3/3 now $739K, St.Croix #4 2/2.5 now $935K, Island Beach Club #350D 2/2 now $1.1M, West Shore #3 3/3 now $1.699M, Tigua Quay #487 3/3.5 now $1.989M, Sedgemoor #102 3/3.5 now $2.495M. 1 new sale: Coquina Beach #5D 2/2 listed at $375K. 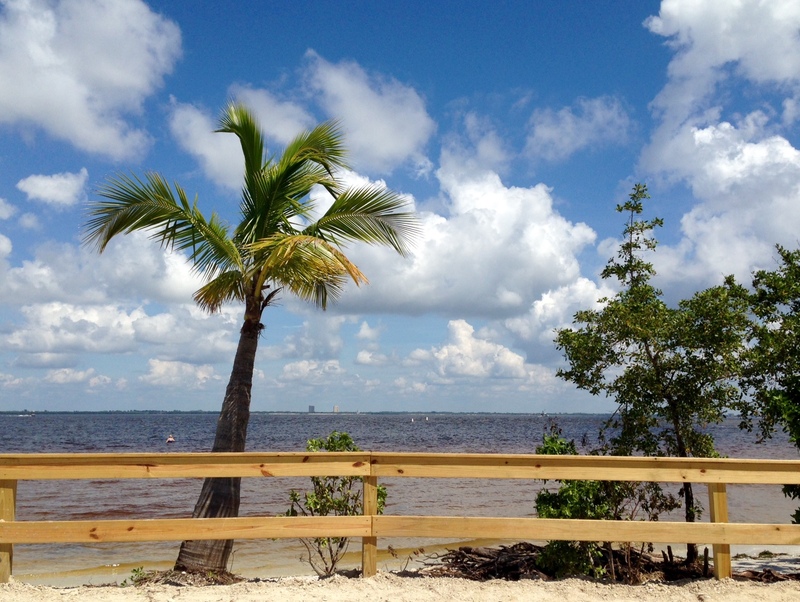 1 closed sale: Tarpon Beach #204 2/2 $795K. 1 new listing: 283 Ferry Landing Dr 3/2 $1.995M. 7 price changes: 847 Casa Ybel Rd 2/2 now $410K, 1490 Sand Castle Rd 2/2 now $515K, 689 East Rocks Dr 3/3 now $765K, 1125 Captains Walk St 3/3 now $799.9K, 1740 Dixie Beach Blvd 3/3.5 now $1.19M, 1317 Eagle Run Dr 4/3.5 now $1.259M, 911 Strangler Fig Ln 4/3 now $2.85M. 3 new sales: 1065 Fish Crow Rd 2/2 listed at $684.9K, 532 Sea Oats Dr 3/4 listed at $1.275M, 3421 West Gulf Dr 5/4.5 listed at $6.975M. 2 closed sales: 1429 Sandpiper Cir 3/3 half-duplex $415K, 5436 Shearwater Dr 3/3 $950K. 4 price changes: 2486 Wulfert Rd now $199,555; 2626 Coconut Dr now $317K; 9066 Mockingbird Dr now $380K, 5821 Pine Tree Dr now $559K. 1 new listing: 13550 Palmflower Ln 4/3.5 $4.85M. 5 price changes: 11525 Chapin Ln 4/4 now $1.495M, 11500 Chapin Ln 4/4.5 now $1.895M, 11523 Wightman Ln 4/4 now $1.925M, 11514 Andy Rosse Ln 4/4 now $2.345M, 16447 Captiva Dr 7/6/2 now $3.75M. 1 new sale: 11461 Dickey Ln 3/2 listed at $1.395M. 2 closed sales: 16861 Captiva Dr 5/4.5 $1.7M, 11520 Andy Rosse Ln 5/5 $2.15M. Bring on the sunshine, Florida is ready for it! It is SusanSusan reporting that it is pretty quiet on the island again this week. Here are a few news items followed by the activity posted over the last seven days in the Sanibel and Captiva Multiple Listing Service. Island weather sure has been mixed. After a cloudy and sometimes soggy weekend (there were no happy super blood moon eclipse watchers here), Monday’s excitement included heavy rains, sometimes torrential. Patience was required while the island drainage system did its magic on land that was already super saturated. By late Monday afternoon, East Gulf Drive at the lighthouse end of the island was closed briefly when the high moon tide brought waves across the roadway. By Wednesday, the islands were back to normal with sunny weather and bright skies, as we tentatively watched the news of Hurricane Joaquin as it developed. With its path paralleling the east coast, just a breezy weekend is expected here. In an earlier Friday update I described the federally-mandated changes with new mortgage disclosure rules that begin tomorrow, this is just a reminder that they essentially are in effect. This will mean that offers with financing contingencies likely will have the closing date later than the typical 30-45 days. New contracts also may have a contingency about these disclosures. Since The SanibelSusan Team’s standard procedures from contract-to-closing include plenty of communication and early sharing of contracts and any amendments with lenders, title companies, and closing agents, we do not expect that these changes will impact us much. With lenders, these changes may just be a temporary bump for the learning curve. Banks will need to provide consumers with more and earlier disclosures regarding their financing. Sanibel and Captiva Islands Association of Realtors members including mortgage company affiliates were advised of these changes at our August Membership Meeting where the details of the new Truth in Lending Act (TILA) regulation were discussed. Scroll down to my August 28th blog for a refresher. 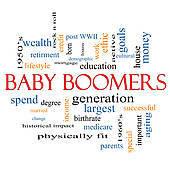 “Baby boomers are the “driving force” of household formation, which is critical for real estate demand, according to a new blog post at the National Association of REALTORS® Economists’ Outlook blog. “The highest gains in household formation have been by 65- to 74-year-olds, who accounted for 860,000 new households alone from the first half of 2014 to first half of 2015, according to Census Bureau data. The 55 to 64 age group comprised the second highest at 391,000, followed by people over 75 years of age who formed 264,000 new households during that time period. “Meanwhile, younger age groups had less. The 20 to 24 age group had negative net household formation numbers of 85,000. The 25- to 34-year-old age group, however, had 159,000 new households during that time. Young professionals have been slow to form their own households. The share of the population living with parents has risen dramatically over the last few years. For the 25- to 29-year-old age group, the percentage has risen from 10% in 1980 to 25% by 2013. Also, the share of 25-to 29-year-olds who have never been married has dropped from 70% in 1980 to less than 40% in 2013. Here are a couple of tidbits from the October 1 issue of ““Ding” on the Wing” which is the “Ding” Darling Wildlife Society Newsletter. “Ding” Darling 2016 Free Film Series includes eight films. Each film is free, but is limited to the first 100 guests in Auditorium A at the “Ding” Darling Visitor & Education Center. See more details on the “Upcoming Events” tab on my web site, www.SanibelSusan.com. It was so quiet Wednesday that SanibelSusan used some of the downtime to clean out office files. One old stash is a folder of info and clippings that I thought might be good for future newsletters. Here is an interesting one that was posted in “The News-Press” Real Estate Section on November 28, 2008. It is from a “question and answer” column by Barry Stone who is a home inspector and nationally-syndicated columnist, known as the House Detective (www.housedetective.com). “A bedroom must be at least 70 square feet in area, with neither dimension less than 7 feet in length. The minimum required ceiling height is 7 feet. When the ceiling is sloped, 50% of the ceiling can be less than 7 feet, as long as no portion of it is less than 5 feet. “A bedroom must also have an openable window for light, ventilation, and fire escape. For light, the window size must be at least 8% of the floor area. For ventilation, the openable portion of the window must be at least 4% of the floor area. For fire escape, the window must be at least 5.7 sq ft. in area. The opening must have a minimum height of 24”, a minimum width of 20”, & a maximum sill height of 44”. It will be like old home week when locals gather at the Farmers’ Market on the grounds of City Hall on Sunday morning. The market will be every Sunday from October 4 to April 24, 2015 from 8 a.m. to 1 p.m. Parking is available in lots at Sanibel City Hall, the Sanibel Library, BIG Arts, and Herb Strauss Theater. Bicycles can be parked at a designated area at City Hall. Handicap parking is located there too. The market also is pet friendly, for the well-mannered. The market is my stop en route to the office on Sundays. If you are looking for local produce, seafood, and more, it is the place to get it. See you there! 5 new listings: Sand Pointe #113 2/2 $789K, Sanddollar #A104 2/2 $795K, Sand Pointe #137 2/2 $1.095M, Kings Crown #317 2/2 $1.295M, Gulfside Place #115 2/2 $1.895M. 2 new sale: Ibis at The Sanctuary #A301 2/2 listed at $463K, Signal Inn #14 2/2 listed at $739K. 4 closed sales: Sanibel Arms #B7 1/1 $300K, Sundial West #B408 1/1 $440K, Mariner Pointe #1092 2/2 $499K, Loggerhead Cay #103 2/2 $760K. 3 new listings: 3335 Twin Lakes Ln 3/2 $874.9K, 580 Lake Murex Cir 3/2 $1.599M, 5615 Baltusrol Ct 4/4/3 $3,999,999. 5 closed sales: 3965 Coquina Dr 2/2 $300K, 3716 Coquina Dr 3/2 $436K, 580 Chert Ct 2/2 $550K, 1388 Tahiti Dr 3/2 $605K, 987 Sand Castle Rd 4/3.5 $650K. 1 new listing: 1820 Ardsley Way $175K. 1 price change: 6411 Pine Ave now $375.5K. 1 new sale: 1304 Eagle Run Dr listed at $219K. 1 closed sale: 971 Main St $180K. 1 price change: Gulf Beach Villas #2031 2/2 $629K. 1 new sale: Bayside Villas #5310 3/3 listed at $580K. 1 closed sale: Tennis Villas #3115 1/1 $265K. 1 price change: 15133 Captiva Dr 3/3 now $3.645M. 1 price change: 15295 Captiva Dr now $950K. Here the shelling should continue to be fabulous! 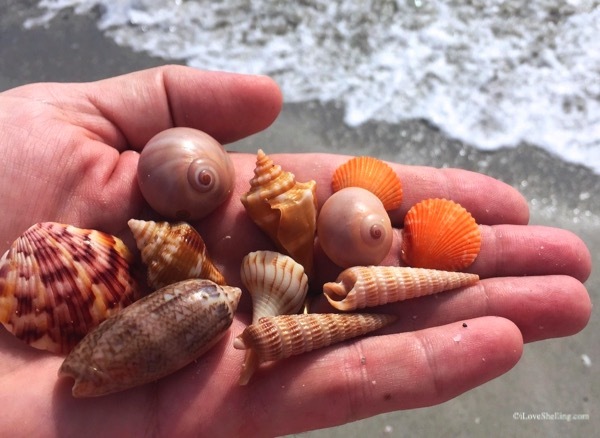 Here are some recent finds posted by local sheller Pam Rambo on iLoveShelling.com (which has great info on island shelling). The SanibelSusan Team has been surprisingly busy again this week. Who said that September is the slowest month of the year? We had several listings shown, some multiple times. We got one condo listing under contract (sold by SanibelSusan) and are working an offer on another one. The team and I too are now ready for three closings coming up next week. This business is always full of surprises and we are thankful for any and all action, particularly as summer winds down. That rainy season weather continues with bright blue skies and wonderful popcorn clouds most days until late afternoon and evening when the rain and lightning storms roll in. Sounds like we are in for a rainy weekend, however, with earlier storms expected beginning today. Yesterday when Dave and I stopped for a quick lunch at Normandie (West Wind Inn) the storm clouds were just rolling in. See photo below. A report of the Multiple Listing Service action is below; but, first a couple of news items. “During last Saturday’s first budget hearing, Sanibel City Council unanimously approved lowering the operating millage rate for fiscal year 2015 to the rolled-back rate of 1.9995 mills, with Sanibel’s revenues estimated at $50,480,097. The tentative budget presentation, delivered by the city’s Finance Director and City Manager offered council members and about a dozen local residents gathered at city hall an in-depth analysis of Sanibel’s property values (which increased 4.82% to $4,300,931,329)…. The rolled-back rate is the millage rate that will bring in the same amount of dollars as the current millage rate after adjusting for new construction. Approximately $19.9 million in new construction occurred on Sanibel in fiscal year 2014…. At the approved rolled-back millage rate, the average residential taxpayer will pay $1,255.23 for all city services, $45.02 less than the previously budgeted millage rate. 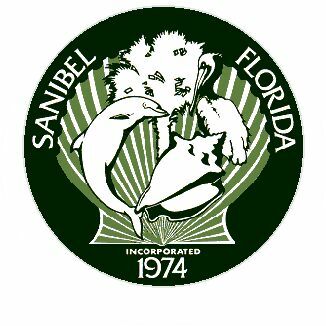 The average residential taxable property value on Sanibel for fiscal year 2015 is $519,871….The city’s final budget hearing will be held on Tuesday, September 16 at 5:01 p.m. at MacKenzie Hall. The spring triathlon tomorrow and Sunday is a family fun fitness weekend held at South Seas Island Resort. The first day includes children fun races: the 6-8 and 9-10-year olds complete a 100-yard swim, 1.5-mile bike, and 0.5-mile run, while the age 11-13 racers face a 200-yard swim, 3-mile bike, and 1-mile run. The next day, adults will swim .25 miles, bike 10 miles, and run 3.1 miles. Elite amateur athletes (who posted qualifying times at a USAT sanctioned event) will be sent off first in their own wave. The triathlon which is sanctioned by USA Triathlon is organized by Southwest Florida Events, a tax-exempt Florida not-for-profit corporation. Info is available online at wwwCaptivaTri.org or on Facebook under Captiva Tri. Those who have enjoyed renting bikes from Billy’s on Periwinkle over the last 15 years may find it more convenient to now rent from his new expanded location in the Bailey’s Center, 2437 Periwinkle Way. The new location offers almost everything available at their original location, including may sizes and styles of bicycles, bike trailers, helmets, and even Fat Boy cruiser bikes. Certain rentals – like scooters and surreys – will still need to be arranged through their original location at 1470 Periwinkle Way. Additionally, Billy’s at Bailey’s now offers customers the opportunity to rent YOLO stand-up paddle boards through partnership with YOLO Board Adventures of Sanibel (www.yoloboardadventuressanibel.com). As a big supporter of BIG ARTS, it was great to get their new brochure this week. Whether you fancy classical, dance, forum, family entertainment, visual arts, jazz/pop/contemporary, theater, film, or community creations, BIG ARTS really is your home for all the arts! Herb Strauss Theater productions coming up include: The Divas, Holiday Spectacular 2014, Freud’s Last Session, The Fourth Wall, Godspell, and A.R. Gurney’s Sylvia. The Monday Night film series runs from October 20 through April 27 with a variety of other films too, include the BIG ARTS Film Academy’s Not-For-Monday-Night Series, “Great Themes” Film Discussion Groups, and a Critically Acclaimed Documentary Series Wednesdays in March. Classical music performances include: Kinga Augustyn, The Merling Trio, Amphion String Quartet, Emalie Savoy, Third Coast Percussion, Svetlana Smolina, and The Souothwest Florida Symphony. The Forum Lecture series features: Arthur Brooks, Ph.D., American Enterprise Institute; Kevin Carey, M.P.A. from New America Foundation; Andy McAfee, Ph.D., MIT Sloan School of Management; Ivo H. Daalder, Ph.D., Chicago Council on Global Affairs & U.S. Ambassador; Evan Osnos, The New Yorker, Pulitzer Prize – Journalism; Dennis Ross, Ph.D., The Washington Institute for Near East Policy & U.S. Ambassador; Karen Tumulty, M.B.A., The Washington Post; Nicholas Burns, M.A., Harvard University & U.S. Ambassador. Jazz/Pop/Contemporary performances include: Riders in The Sky, Jack Jones, So Good for the Soul, and Tom Chapin. There also is a National Geographic “Live” family program and “The Second City” comedy. Visual Arts include a variety of exhibits right through “season”, plus the Photography Scavenger Hunt that SanibelSusan sponsored last year. I will be the sponsor again this year too, with proceeds to benefit the BIG ARTS scholarship programs. Community Creations include poetry events, play readings, a Wendy Webb concert, and the BIG ARTS Concert Band concerts. I still sing with the BIG ARTS Community Chorus which also has Holiday and Spring Concert performances. There is more info at www.BIGARTS.org. If you want tickets, do not delay, one of the Forum events already is sold out. Here is an article with some good advice from “HouseLogic” on-line. The author, G.M. Filisko is an attorney and award-winning writer who has survived several closings. A frequent contributor to many national publications including Bankrate.com, REALTOR® Magazine, and the American Bar Association Journal, she specializes in real estate, business, personal finance, and legal topics. “Have a plan for reviewing purchase offers so you don’t let the best slip through your fingers. You’ve worked hard to get your home ready for sale and to price it properly. With any luck, offers will come quickly. You’ll need to review each carefully to determine its strengths and drawbacks and pick one to accept. Here’s a plan for evaluating offers. Carefully evaluate all the terms of each offer. Price is important, but so are other terms. Is the buyer asking for property or fixtures—such as appliances, furniture, or window treatments—to be included in the sale that you plan to take with you? 1 new listing: Kings Crown #108 2/2 $695K. 2 price changes: Sundial #D207 1/1 now $239K, Sanibel Inn #3512 2/2 now $699K. 5 new sales: Sundial #D407 1/1 listed for $230K, Sundial #H102 2/2 listed for $440K, Island Beach Club #310F 2/2 listed for $474K (our listing & sale), Sanibel Siesta #502 2/2 listed for $595K, Compass Point #112 2/2 listed for $1.135M. 2 closed sales: Blind Pass #D204 3/2 $375K, Seascape #204 3/3.5 $1.735M. 5 new sales: 2098 Wild Lime Dr 2/2 listed for $280K; 5289 Umbrella Pool Rd 3/2 listed for $499,995; 981 Main St 4/2.5 listed for $599K; 420 East Gulf Dr 3/3 listed for $749K, 1021 Fish Crow Rd 4/3 listed for $749K. 1 price change: 592 Sea Oats Dr now $339K. 1 new sale: Ventura Captiva #5B 3/3.5 listed for $965K. 1 closed sale: Sunset Beach Villas #2313 1/1 $520K. 1 new listing: 11520 Laika Ln 2/2 $2.75M. 1 price change: 15747 Captiva Dr 5/6.5 now $6.495M. 1 closed sale: 16447 Captiva Dr 7/6/2 $2.668M (short sale). Even if it rains on the islands, it’s still paradise! Weekend wishes to all!